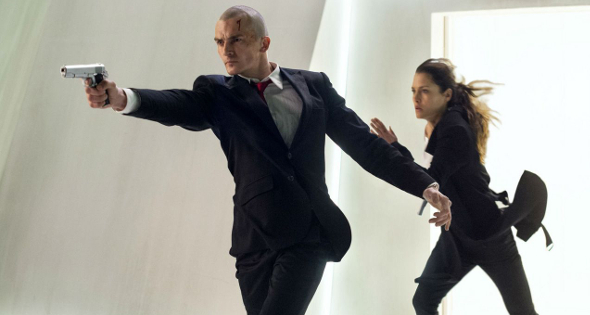 20th Century Fox has released the first images from the Hitman film reboot, Hitman: Agent 47. The movie stars Homeland actor Rupert Friend as Agent 47. Paul Walker was originally cast for the role when the film was first announced in February 2013. The first film adaptation of the IO Interactive steal series, was released in 2007 and starred Timothy Olyphant. According to SlashFilm, footage shown at Comic-Con last weekend were heavy on action including a car chase and an escape from an interrogation. Friend was unable to appear at the panel, however co-stars Zachary Quinto and Hannah Ware were there to discuss their characters. Hitman: Agent 47 is being directed by first-time film director Aleksander Bach, and Fox announced last month that it will release February 27th, 2015.